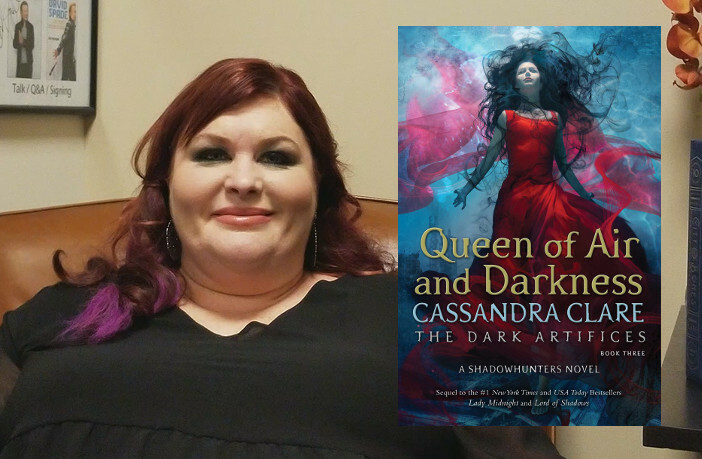 At her L.A. Stop for QUEEN OF AIR AND DARKNESS, we spent some time with Cassandra Clare to talk about what’s going on and what’s to come in the Shadow World. Ever since City of Bones was released in 2007, the Shadow World has been a part of our lives. We’ve seen these characters from Cassandra Clare‘s imagination grow and learn, suffer and mature, and fall in love and love and love. And it’s always a joy to see another book from this world be released upon the masses. Queen of Air and Darkness is the latest one to hit our bookshelves. After reading it, we have questions, and although we couldn’t ask Cassandra all the questions we wanted to, we were able to spend some time with her during her busy touring schedule. It may not answer a whole lot about the book, but we do get a bit of information about Queen as well as some of her other upcoming books. So, we hope you find this session a insightful. 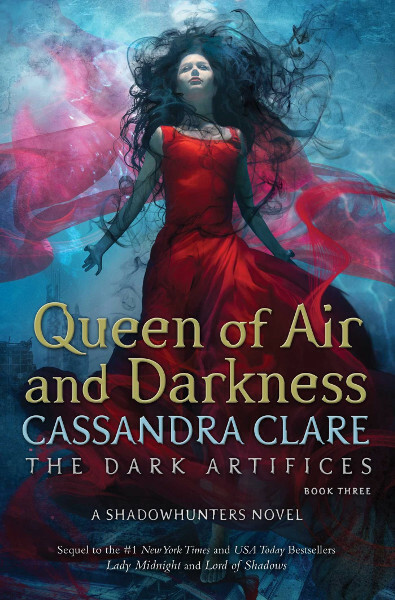 WARNING: There are spoilers regarding Queen of Air and Darkness, the third book in The Dark Artifices trilogy, so please skip this post if you haven’t read the book and don’t wish to be spoiled. In Queen of Air and Darkness we see the return of quite a few familiar characters, including one seemingly grumpy warlock (Ragnor Fell.) Was this always the plan? It’s been the plan for a while now to bring Ragnor Fell back, because initially he was just a very minor character who died off-screen. And then he kind of found a new life in The Bane Chronicles and by the time I was done with The Bane Chronicles, I was like, I really love him, but I’m so sad that he died like a punk *laughs* in this way. And so I thought, you know, we never saw a body, we never saw him die, we just heard that he died. So I believe he can come back. And so the story of how Ragnor is discovered not to be dead and how he is rescued by Magnus and Alec and Clary and Jace and Isabelle and Simon is in The Eldest Curses. 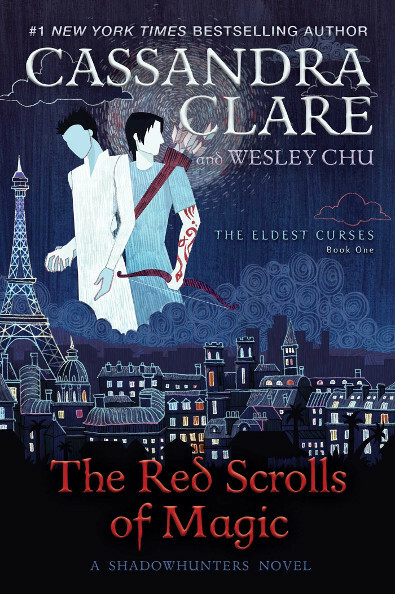 It’s the series that starts with The Red Scrolls of Magic and then goes on to other books. There is actually a whole story there, but right now we’re only seeing a little bit of it from Queen of Air and Darkness, because the people who this story is about – Emma and Julian, Kit and Ty, y’know, Diana – aren’t really people who know about Ragnor or care about Ragnor all that much. He wasn’t a friend of theirs, he wasn’t somebody they knew, so we’re getting the kind of Rosencrantz and Guildenstern are Dead view of “Ragnor came back.” They have kind of a sense that Ragnor’s someone who’s important to Magnus. It’s mentioned in the book that Clary and Jace and Simon and Isabelle know him well, which they didn’t earlier, so that’s meant to be a kind of clue that something has happened. So, we will get that full story. You had a few easter eggs in your previous books. Can we expect to see some in this book as well? If so, can you hint at any? There’s a mention at the Shadow Market of a copy of the Red Scrolls of Magic that’s floating around. There are mentions of things, especially in Lord of Shadows, but a little bit in Queen of Air and Darkness, of things that happened during The Last Hours, to a much earlier generation of Blackthorns and Carstairs. There’s a bunch of characters that cross over, so we see, for instance, a warlock whose name is Hypatia Vex, who’s a pretty important character now, and she’s also going to be significant in The Last Hours, so seeing her here is kind of a lead into seeing her later so there are definitely overlaps. 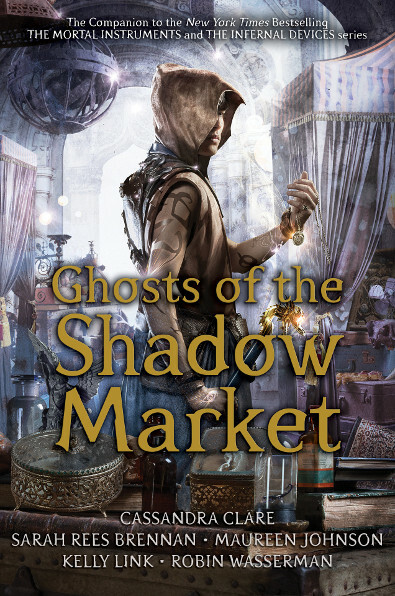 There are two more novellas that will be in the print edition of Ghosts of the Shadow Market. What can you tease about that, if any? Well, we couldn’t release them before Queen of Air and Darkness because they’re very spoilery, and, in fact we didn’t feel it was safe to release them any time near Queen of Air and Darkness, so they wound up being a thing we decided to include in the print edition. So, there’s two stories. One is called Ghost of Old Loves and one is called Forever Fallen. Ghost of Old Loves has to do with a ghost that we meet in Queen of Air and Darkness, so if you’ve read it you will know who I mean, so a good portion of that story is from that ghost’s perspective, and that perspective on sort of our characters from The Dark Artifices, specifically Ty, and also Dru. And then Forever Fallen is a story that has to do with a certain bad guy that shows up at the very, very end of Queen of Air and Darkness. So, we get his perspective and kind of what he’s planning and what he’s up to, while at the same time we also get a parallel story that’s more about Kit Herondale. There are two really fun stories, I really love them, but we totally couldn’t release them before we released Queen of Air and Darkness. This certain evil character, you almost get a sense of bittersweetness, though, because of the fact that this is a character that’s from a parallel world and it could’ve very well been this world. It seems that you’re bringing back Jace and Clary as main characters in The Wicked Powers as part of the ensemble group. Am I correct in saying that? It would seem that they have a significant part to play in The Wicked Powers because of bringing in Thule Jace, who is obviously pretty obsessed with Clary, but he’s also obsessed with Alec and he’s obsessed with Simon and obsessed with Isabelle, he’s kind of obsessed with them all, and he has plans that affect everybody. And Ash is actually a really significant character in The Wicked Powers and his relationships with Dru and Kit and Ty are part of what sort of [powers those books,]so I would not say that Clary and Jace are main characters, because Dru, Kit, and Ty are the main characters, but they’re definitely in it and definitely they are significant because of their relationships with this particular bad guy, who is, like you said, kind of a bittersweet figure. He was once a good person and he’s been terribly tortured and brainwashed and basically had his personality erased by Sebastian and so he is Jace that we know and love, but after he has gone through all of this terrible stuff, that has reshaped his personality. So, that’s always kind of a bittersweet thing to see. 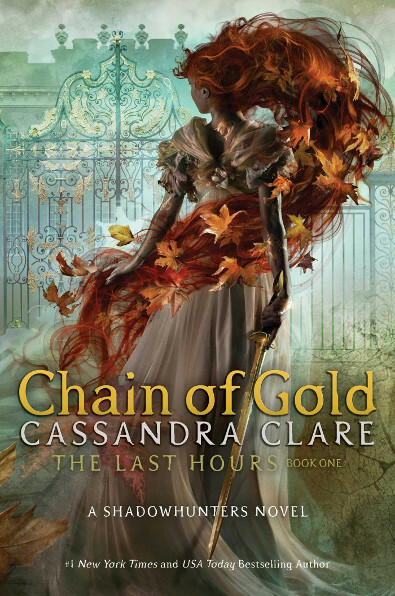 With the reveal of the Chain of Gold cover, what can you tell us about the book that you haven’t revealed yet? Cordelia’s on the [Chain of Gold] cover, so I’m really happy to have her front and center. Cordelia is in many ways the most significant character, certainly in the first book. A lot of the story is her story and I think that’s because the book is a lot about this group of people who are the children of the characters we knew in The Infernal Devices – Will and Tessa’s kids, Sophie and Gideon’s kids, Gabriel and Cecily’s kids – and so they’ve all known each other all of their lives, but they don’t know Cordelia. And so, she comes into this situation, this whole social group, and is basically a stranger to them, and so she’s kind of able to see that group from the outside without already being part of it, and I think that’s a very valuable point of view. You kind of get a new perspective on people. Then pretty much as soon as she arrives, this terrible thing happens, and so the Shadowhunters kind of have to all band together to fight it. True, we don’t know a lot about Cordelia at this point. We know that Jem is her uncle, that her father is Elias, that she is biracial, her mother is Persian, and she has a brother, his name is Alastair, and he’s kind of a jerk *laughs*. And that she is in love with James Herondale, and has been for a long time, but when she arrives in London, discovers that he is in love with somebody else. How big do you plan on making your ‘Pool of Tears’ with this new trilogy? *laughs* I think there’ll be hopefully some tears. Umm, it’s definitely━I would say that with the historical novels, there’s a very different feel to them. They have a sort of bittersweetness, the nostalgia of the past; there’s a knowing that the people in these books aren’t alive now, and so, the kind of inevitability of people passing. But also there’re stakes in those books that are different, because in the current books, I can be like, well, maybe the world will end, right? We can always threaten total annihilation of the universe. But we can’t with something set in 1903. We all know the world didn’t end in 1903, so the stakes are really people’s emotional lives and emotional pain, so I feel like you’re leaving more emotion on the page. Will there be like a connection between this set of books to The Wicked Powers, similar to what we’ve seen in previous sets? Well, there are always connections. We deal with a lot of the same families, and so we always see connections down through the families, so Cordelia Carstairs is Emma’s ancestor. We’re gonna meet━you know, the girl that James is in love with is Grace Blackthorn━so she’s the ancestor, possibly, of the Blackthorns, or certainly related to them in some way. And in the same way, we see the earlier Herondales and the earlier Lightwoods. So, there’s definitely the familial connections that sort of bind people together through the generations. Yeah, there’s connections of events and things like that. There’s little connections of pieces of overlapping history the same way there were in Mortal Instruments and Infernal Devices. There’s a scene in Lord of Shadows where Emma picks up a picture and it’s a photograph of Cordelia, and there’s a quote written on the back, and that quote is significant in The Last Hours. It’s now been over 10 years since City of Bones, your first book in the Shadowhunter Chronicles, was published. If you could, what advice would you give to your pre-City of Bones self? *lets out a deep breath* Oh my gosh. Um, I think I would tell myself to make maps. *laughs* I didn’t for a long time, and I began to be very confused about where everything was spatially, and to be meticulous about notes because I hate when there are plot holes. And I would probably tell myself kind of to relax ‘cause I━initially when I had books coming out, you get very, very emotional about people’s responses to every book. It’s a long story, this story. And it takes place over many, many different books, and so I feel like there’s actually━it’s not so much the reaction of individual books, it’s how people feel about the series as a whole in the end. Can’t wait to read them all. I love Shadowhunters . from book 1 to the l0 queen of air and darkness . what’s up with Annabelle?